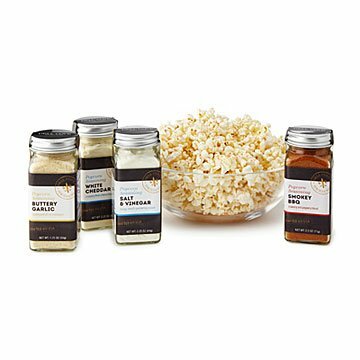 David & Patricia Beets' mouthwatering handmade seasonings turn popcorn into a special snacking occasion. Popcorn. Easy. Cheap. Crunchy. Healthy. And, let's be honest—on the bland side, when naked. Butter fixes that, but then there goes the whole healthy thing. David and Patricia Beets' mouthwatering handmade seasonings taste better than butter, and have way fewer calories. Each set contains four deliciously formulated bottles of their sweet and savory blends. Bring the taste of traditional carnival popcorn to your kitchen with Classic Kettle Corn, or sprinkle on savory Buttery Garlic for the taste you love. Set comes in a gift-worthy black box. Made in Chicago, Illinois. Add a WOW to your POP! You could probably use the Garlic to bake up Garlic Bread. This product was a big hit! My friend loves the spices and I can't wait to try a few! My fiance loves popcorn, and he thought this was a great gift. We use it all the time! A big hit at Christmas!!! Was a hit for popcorn. But I would use the seasonings for everyday cooking as well!! Bought the sweet set as part of a Christmas ift for my boyfriend's parents. I sent with microwavable corn cobs and a bowl that doubles as a popper to make a whole popcorn gift box. I thought the seasonings were cute. I didn't open them up to try but the box they came in was very heavy so I imagine they are nicely made with the hand-made TLC I come to expect from Uncommon Goods gifts. Great replacement option for prepackaged microwave popcorn. I bought the popcorn on the cob and the seasoning flavor pack together. The advertising did not mention that the flavoring had to be applied to popcorn that had been popped using oil or butter, so putting the cob in the bag to pop the corn made it so the seasoning would not stick to the popped corn. Very disappointing, especially since the duo was a gift to friends and quite expensive for the 2.